Ask fellow campers about "Timbercrest Camp and RV Park (formerly Kandels' Camping & RV Park)" and nearby attractions. Park was very full and had to settle for a back-in site which was very adequate. Nice and helpful young woman at check-in. Our "faithful" GPS took us on a wonderful, if a bit convoluted, route to get there through the Amish countryside. The only complaint about the park was the not so great (to put it mildly) water. Unfortunately, we took on a full tank of it and suffered through drinking it for the next few days (even using it for tea didn't cover up the taste). Maybe it's just a matter of us being used to a different type of water at home (in Colorado). That said, it was a great experience and we'd gladly stay here again. We camped at Timbercrest Camp and RV Park (formerly Kandels' Camping & RV Park) in a Fifth Wheel. As others have suggested, the nearby Yoder Amish Home is a worthwhile visit. We also drove to the Pro Football Hall of Fame in Canton. It's an excellent place to visit if you're a super pro football fan. I'm glad I visited it, but don't know that I'd go back again. We found Millersburg a bit too busy and touristy for our taste. Thank you so much! We hope you enjoyed your stay! And look forward to having you camp with us again. This is a great, up & coming cg. Very clean and well maintained. While very basic right now, the new owner is seeing his second season and has plans to plant trees, install a pool, and other amenities. This cg is located in the heart of Amish country so you need to be very careful on the road for buggies, bikes, and farm equipment. The ladies that checked us in were baking cookies and graciously gave us 2. That set this visit off on the right foot!! One M&M and the other peanut butter. Yum! Great walking around the cg and out to the main road which is about a half mile down a gravel road. Would definitely stay again. We camped at Timbercrest Camp and RV Park (formerly Kandels' Camping & RV Park) in a Motorhome. President Garfield's Presidential Library in Mentor, OH. President McKinley's Museum and First Ladies Museum in Canton, OH. Der Dutchman Restaurant is not much to write home about. Clean and hearty but not much selection and little taste. Sugar Valley Meats has an excellent selection of meats and products to choose from. Off the beaten path so service and prices are much better. Love the mustard eggs, jerky, and beef sticks. Our T-bones were tender and very tasty. Thank you so much for your gracious review. We throughly enjoyed your stay and hope you will stay with us sometime soon. We're glad you enjoyed the cookies. Nice park Very close to Walnut creek easy in and out . We stayed during 4th of July in a 45' motorhome. Park is clean and well maintained. We camped at Timbercrest Camp and RV Park (formerly Kandels' Camping & RV Park) in a Motorhome. Long gravel drive and interior roads. Your RV will get dusty. Interior roads are easy to drive even with a big rig. Office staff are friendly and efficient. All main sites are pull-through with full hook ups, fire ring and picnic table. There is a decent space between you and your neighbor. No shade on these sites. Satellite TV was no problem. Verizon had 2 bars. Free WiFi ran at a moderate speed. We camped at Timbercrest Camp and RV Park (formerly Kandels' Camping & RV Park) in a Motorhome. Your are in the center of Ohio Amish. Most activities and shopping are withn a 20 mile radius. We enjoy the auctions held at various locations during the week and the annual charity auctions in the summer. Local restaurants are wonderful. Timber Crest / Kandels' was a great place to stay. We arrived close to midnight and our name and campsite were posted on the office window. The sites were level (which is very important when setting up at midnight!) and clean. Bath house was new and extremely clean as was the laundry facility which includes ones washer and dryer. The campground is very close to town while also being very quiet and peaceful. Roads and sites are gravel but well maintained. 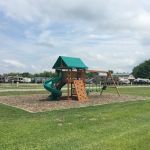 We camped at Timbercrest Camp and RV Park (formerly Kandels' Camping & RV Park) in a Travel Trailer. Great plays at the Ohio Star Theater. Yoder's Amish Home is a wonderful insight into Amish living. And check out the world's largest cuckoo clock in Sugarcreek. Walnut Creek Cheese is a fun grocery store. Park St. Pizza in Sugarcreek is some of the best pizza we have ever had! If you have a sweet tooth visit Coblentz chocolates. This is a great little park in a Amish country setting. A little off beaten path. Close to Amish Villages. very Quiet. Friendly Stayed here twice this summer. Back in sites have shade. Pull thru sites long enough for large rigs. We camped at Timbercrest Camp and RV Park (formerly Kandels' Camping & RV Park) in a Motorhome. Visited friends who were staying there, thinking about moving there, but soon changed our minds. The place was very unkept, up on a hill, dry, desert looking. No shade trees, very plain. They did have restroom facilities which is a plus especially when you have friends stop by. They should plan an improvement every year, pads, patios, trees, etc. which would help a lot. I will add the staff was very friendly. We camped at Timbercrest Camp and RV Park (formerly Kandels' Camping & RV Park) in a Motorhome. Close to Walnut Creek and all the other towns, restaurants,,etc. This campground is under new management. The office staff was very nice but still finding their way. The new name is Timbercrest Camp and RV park. Phone number is unchanged. New website is www.timbercrestrvpark.com. It would have been nice if the grass had been mowed prior to our arrival since they knew our group had reservations. We camped at Timbercrest Camp and RV Park (formerly Kandels' Camping & RV Park) in a Motorhome. Middle of Amish Country. Visit Lehman's, Heini's and Der Dutchman restaurant. Wonderful place, very clean, very friendly would recommend to everyone. We camped at Timbercrest Camp and RV Park (formerly Kandels' Camping & RV Park) in a Truck Camper. Thank you so much for your kind response. We hope you enjoyed your stay and will come visit us in Amish County again. 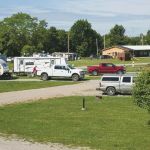 This is a fairly well maintained campground, with friendly and helpful owners at check in.The interior roads and sites are gravel with weeds. Our pad was long and level but not overly spacious, big rig access was fair. It was very quiet at night, no privacy around our RV, but there was space for our towed. No shade trees, some grass between sites and some sites had a picnic table, ours did not. The bathrooms were old but adequate, but they did need a good clean, the so called laundry had one washer and one dryer, not enough for this size of campground, as some folk just hung their washing outside their RV's. Pet friendly but no dog walk and no doggie bags or disposal station. WiFi was worse than useless but cell was okay. There are small local food stores in Walnut Creek, as well as great restaurants and plenty of unique shops to explore. We would not stay here again, this campground is mediocre at best, it could be a great campground, but the owners need to spend time and money on it. We camped at Timbercrest Camp and RV Park (formerly Kandels' Camping & RV Park) in a Motorhome. This park is in a quiet, country setting near Walnut Creek. Long straight gravel drive to park. Interior roads and site driveways are gravel. Layout works well for access with even the largest rig. Owners are extremely friendly and helpful. The building containing the restrooms, showers, laundry and meeting rooms appears to be very new. We camped at Timbercrest Camp and RV Park (formerly Kandels' Camping & RV Park) in a Motorhome. 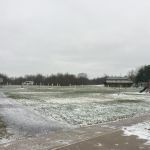 This park is near the center of Amish area, so you are near to almost all to see and do. This park has 2 nice meeting rooms to handle multiple camping clubs at the same time. The park is excellent for larger units. The entrance road and roads within the park are not high quality. Once you unhook and examine the entire facility, you quickly learn that this is a better facility than the roads. I would not stay here for the summer, but it is a very nice park for a short visit to Amish Country. We camped at Timbercrest Camp and RV Park (formerly Kandels' Camping & RV Park) in a Fifth Wheel. We stayed here due to the brand new restrooms that were clean, modern, and exceptional including the showers. Above them is a common room for groups and games. The park has wide gravel roads that are not hard to negotiate with a big rig and each full hookup site is easy to get into with the awning facing east so the sun in the evening is not on the awning. There are also electric only sites with easy access. A dump station is available for everyone. The park is quiet with no light pollution for star gazing. Many Amish attractions are nearby. Would rate the park a 10 if they had any trees for shade. We will return. We camped at Timbercrest Camp and RV Park (formerly Kandels' Camping & RV Park) in a Travel Trailer. Clean, quite and safe. Stars at night. A bit off the beaten path but worth the 5 miles. Nice size sites. Friendly people and helpful. Call and get directions as GPS will take you on back winding roads. Beautiful Amish country with a lot to see and do. It is 40 minutes to Canton for the football hall of fame. Will stay again. We camped at Timbercrest Camp and RV Park (formerly Kandels' Camping & RV Park) in a Fifth Wheel. We used this campground as our base while visiting the area. The sites are adequate, hookups in good working order, picnic table and fire ring at site. It is off the beaten path a bit, but location is good for sightseeing in the area and it is quiet at night. Verizon signal was strong, roof satellite dish had clear view, and the campground free Wi-Fi was very good. The shower and bathrooms were clean, the laundry consisted of one washer, one dryer. A good, no frills park, if you don't need a lot of extras this park is a good value. We camped at Timbercrest Camp and RV Park (formerly Kandels' Camping & RV Park) in a Motorhome. Are you affiliated with Timbercrest Camp and RV Park (formerly Kandels' Camping & RV Park) ?